Here are details on the August jobs report, automotive sales, and a couple of companies making headlines this week. Stocks managed to bounce higher toward the end of Friday, the last trading day before the holiday weekend, on a jobs report that was enough to support stocks yet diminish the possibility of a Federal Reserve rate increase in September. The Labor Department reported that the U.S. economy added 151,000 jobs in August, which was below a market consensus of about 180,000 and a sharp drop-off from June and July, which were both adjusted to be between 270,000 and 275,000 jobs. As with any economic data these days, investors should take it with a grain of salt, or, better yet, just ignore it until the Fed meets Sept. 20-21, for more concrete economic comments, and continue with a long-term horizon for owning stocks. With that out of the way, let's look at some stocks making big moves or big headlines this week in the markets. What's the auto industry have to say? One intriguing way to gauge the health of consumers can be to watch sales of big-ticket items, such as vehicles. Analysts have been predicting that new-vehicle sales in the U.S. were going to peak sooner, rather than later, and that appears to be happening as we speak. While sales may indeed be peaking, it seems likely we're in store for years of very strong annual sales, despite volatility in monthly gains and comparisons. Zooming in on Detroit's largest automaker, General Motors (NYSE:GM), its overall sales declined 5.2%, which is to be expected, as the automaker has significantly reduced its sales into fleet channels this year. But more telling is that GM's retail sales, those to individual consumers, declined for only the second time this year. Despite the declining sales, GM's tight inventory management and a consumer preference for higher-priced SUVs and trucks helped push the automaker's average transaction prices (ATPs) higher in August. "Our retail strength is reflected in our record ATPs in August, which were up more than $1,600 from last month and nearly $5,800 above the industry average while our incentive spending was below the industry average and well below our domestic competitors," Kurt McNeil, GM's U.S. vice president of sales operations, said in a press release. Despite peaking sales, if major automakers can continue to avoid an incentive war, the industry should remain highly profitable in the years ahead. Caesars Entertainment Corp. (NASDAQ:CZR), which owns a number of establishments on the Las Vegas Strip, were crushed to start the trading week. Shares plunged as much as 28% before recovering to a loss of 16%. The driving force behind the decline was a judge ruling that Caesars will have to face $11 billion in lawsuits from bondholders after Caesars made an alleged series of sketchy moves and transactions in 2013. The moves allegedly kept assets out of the reach of bondholders, but now it appears Caesars is going to face the music. But companies go to court every day, so why is this a big deal? As Foolish colleague Travis Hoium pointed out: "The very real possibility is that this could drag Caesars Entertainment into bankruptcy. The company doesn't have enough money to pay back all of its debt, and if you include CEOC, it's still losing money. So bankruptcy might be the only option." What happens in Las Vegas stays in Las Vegas, but it's no secret the "City of Entertainment" wasn't built on winners. Over time that's led to a shift away from gambling revenue for Las Vegas casinos and resorts, and it's clear some of the major players are struggling to adjust to the new reality. As a consumer, the Las Vegas you know and love will likely be around forever, but, as an investor, it might be a place you want to avoid. Investors of Abercrombie & Fitch Co. (NYSE:ANF) had a reality check this week after the teen-apparel retailer announced a disappointing second-quarter earnings report. Shares of the company were down almost 25% for the week, with no immediate relief in sight. Looking at the results, we see total revenue dropped 4% to $783 million, which was within expectations, and its comparable-store sales dropped a larger 7% and 2% at Abercrombie and Hollister stores, respectively. The bottom line checked in a nickel worse than analysts expected, at an adjusted per-share loss of $0.25. This isn't a problem Abercrombie faces alone, albeit not a comforting statement for investors, as it's merely another teen retailer that has hit speed bumps in recent years. Not only is the clothing retail industry facing significant challenges thanks to a shift to e-commerce, but the teen segment is also a tough demographic to pin down for trends and advertising. 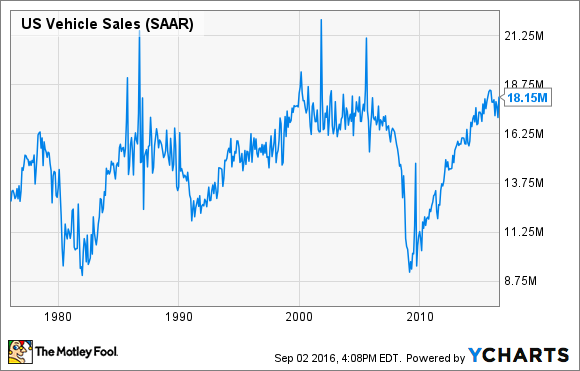 For those reasons, investors should expect the comparable-store sales and revenues to remain disappointing throughout the remainder of 2016.